General Rubber serves the Maintenance, Repair and Operations (MRO) sector by focusing on our Plant Reliability and Efficiency Program (PREP). We utilize PREP to transition our customers from an overly conservative calendar-based replacement program, or a somewhat reckless run-to-failure based approach, to a condition-based predictive maintenance program. We deploy our industry experience and performance products through PREP, and work with the MRO market to deliver performance replacement products and industry best practices. General Rubber’s PREP program covers training and implementation of traditional visual and physical inspection methods as well as dimensional verification. 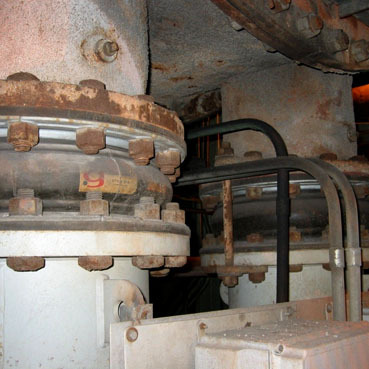 These factors are industry standard for understanding the degradation of rubber expansion joints and are key for reliability. Additionally, we cover advanced Nondestructive Evaluation (NDE) methods which further our understanding of degradation methods by inspecting internal conditions of expansion joints in the field. General Rubber also provides on-site surveys, where we combine these traditional and advanced inspection techniques with our experience to provide a Failure Modes and Effects Analysis (FMEA) report which quantitatively assesses your system’s failure risks and provides corrective actions. Our performance replacement expansion joints can be manufactured to any custom field dimension or condition and utilize advanced materials of construction, guaranteeing zero leakage and maximum service life. Combining our performance products with our predictive maintenance program has proven to be invaluable to the challenging issues faced by the MRO sector. Please contact us to learn more about our PREP program, training opportunities or site visits.